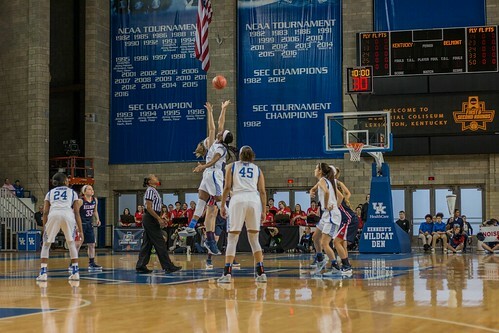 The Belmont women’s basketball team ended its 21-game winning streak in the first round of the NCAA women’s basketball tournament with a 70-73 loss Friday to the Kentucky Wildcats. Junior Kylee Smith led with 23 points, and junior Sally McCabe achieved a double-double with 16 points and 12 rebounds. The ladies put up an impressive performance leading 36-35 at the end of the first half. “Even with what they did, we’re still right there knocking at the door and that is the resolve, the resiliency, the toughness that our kids have. If you didn’t see that you’re crazy,” said head coach Cameron Newbauer in the post-game press conference. The Bruins unfortunately could not hold on to the lead and trailed for the entirety of the second half with the greatest deficit being seven points. “It wasn’t anything that we didn’t execute, it wasn’t anything we didn’t do from an offensive standpoint when we had chances to tie, but at the end it was just Kentucky just scored shots,” said Newbauer. The ladies were down by 12 at one point in the first half and seven during the second half. Both times they came back to keep the game close. The Bruins were down by only one point twice in the last 13 seconds of the game, and the end came down to a last second 3-pointer. In the end, the ladies were not able to make up the final three points needed to tie the game. Thought they feel the burn of the loss right now, they are ready to get back into the gym and work toward the next season.